GAINESVILLE, Fla. White nationalist Richard Spencer’s voice was nearly silenced Thursday as he attempted to deliver a speech on his views at the University of Florida. Many protesters stood with their fists raised, chanting to “Go home Spencer” and “Nazis are not welcome here” throughout the entire speech. “At this point it was either come and protest or be complicit by doing nothing,” said Becky Williams, one of the 2,500 protesters on campus during the event, according to the university. 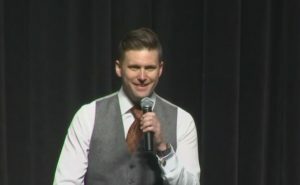 Spencer took the stage at the Phillips Center for the Performing Arts at around 2:45 p.m. and quickly left the campus once his speech wrapped up just after 4 p.m.
Update: Richard Spencer event has concluded and he has left the University of Florida campus. “He has the right to speak, but we have the right to speak too,” protester Linda Lombardino said. There were a lot of empty seats and the venue was not full. Counter-protesters and some supporters gathered outside the venue with signs after the event concluded, but officials worked to reopen the roads at around 6 p.m.
“There’s no room for hate in our country anymore. That ended back in World War II and it’s not coming back ever again,” protester Jacob Gary said. Five minor injuries were reported. Some students concerned for their safety made the decision to stay away from the event. “99 percent of my friends are locked down in their dorms they’re not coming anywhere near campus,” student Peter Doyle said. The event was Spencer’s first planned visit to a college campus since he participated in the “Unite the Right ” rally in Charlottesville, Virginia, in August. Gov. Rick Scott declared a state of emergency Monday for Alachua County, where the university is located, ahead of the controversial speech. University and local officials took considerable steps to prevent the event from becoming hostile. Heavily armed police arrested 28-year-old Sean Brijmohan on campus ahead of the speech, according to the Alachua County Sheriff’s Office. Brijmohan is accused of carrying a loaded gun underneath his shirt, handcuffs and a badge. Brijmohan claimed he was a media security officer, deputies said. A second confirmed arrest was made at 4:09 p.m., according to the Alachua County Sheriff’s Office. David G. Notte, 34, is accused of resisting an officer without violence. Information from The Associated Press and CNN was used in this report.